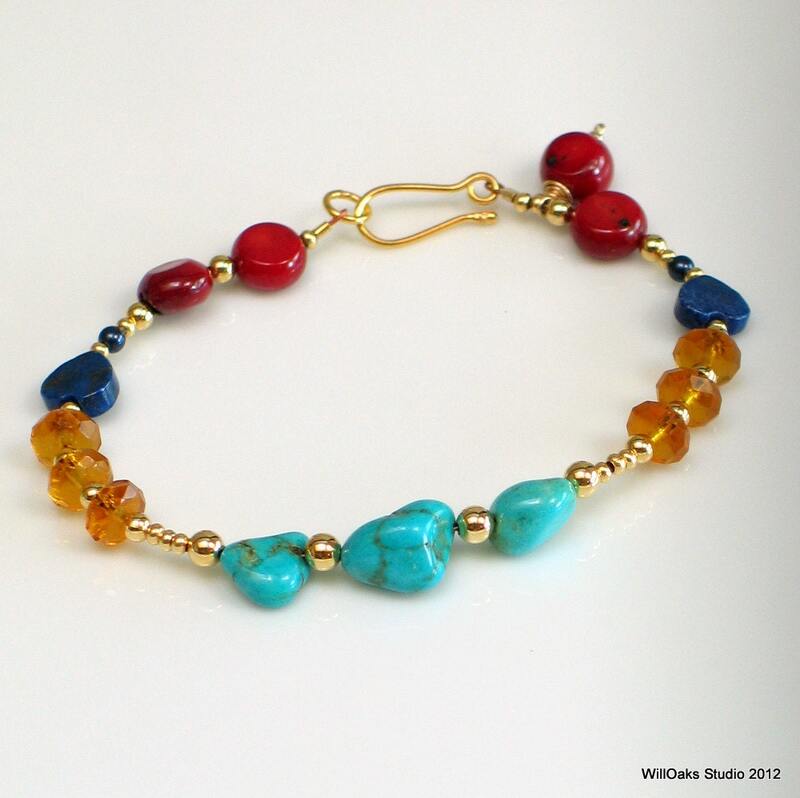 Turquoise nuggets with clear primaries-red, yellow, blue-for a Joyful beaded bracelet with gold-findings. Turquoise, Czech crystals, Lapis Lazuli hearts, and deep ruby red coral disks mixed with gold plated beads and a vermeil (gold plated sterling silver) hook and eye. 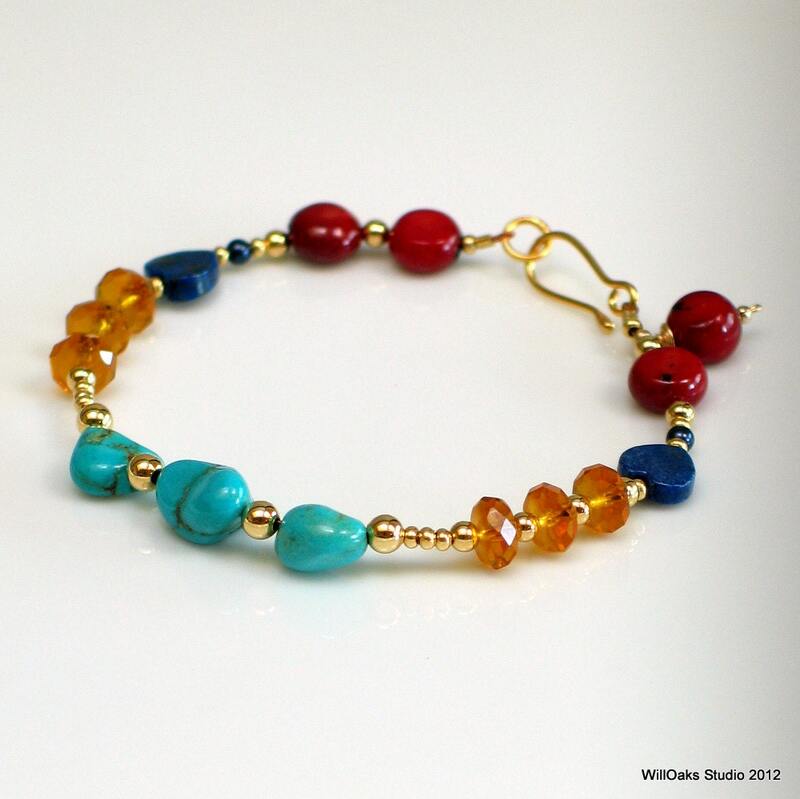 Lighthearted, flirty affordable bracelet made to cross seasons, anytime bright jewelry is the perfect touch. 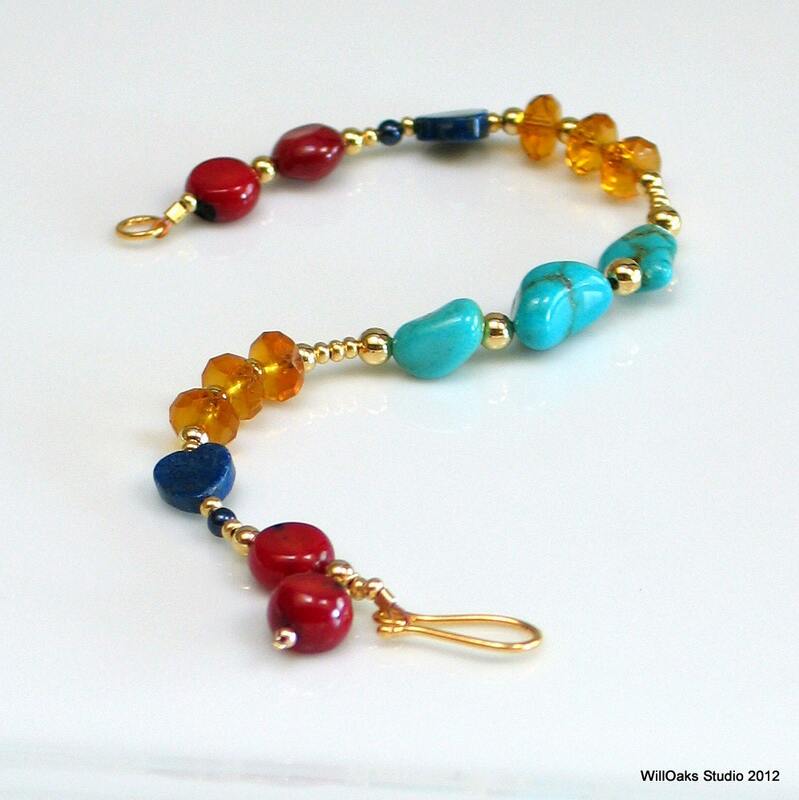 The contrasts of organic shapes in nuggets and discs, with crisp faceted amber yellow crystals, and with hearts cut from natural dark blue lapis all inspired my original bracelet. 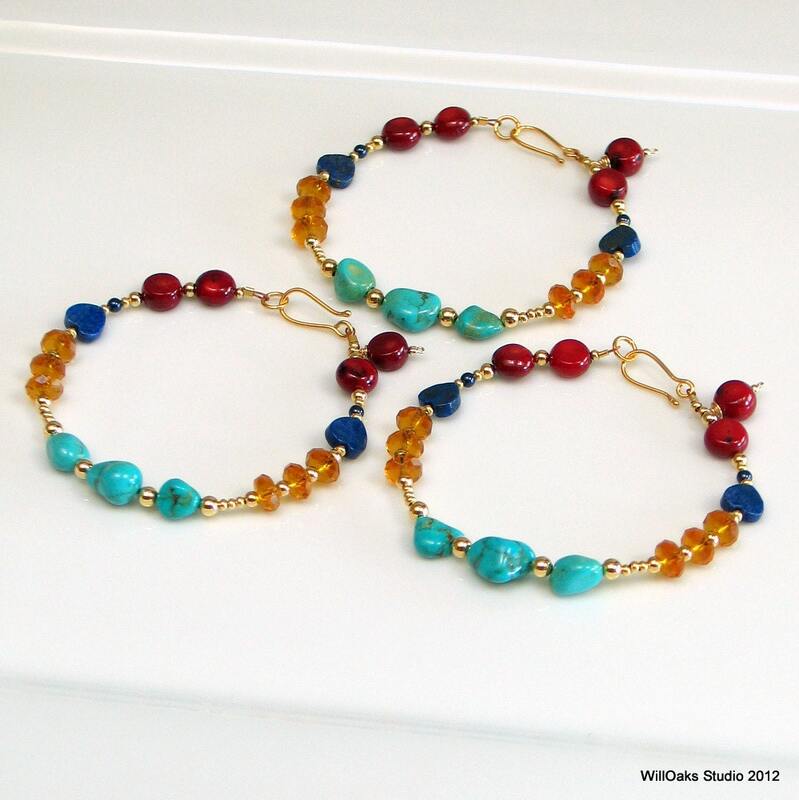 My earlier pair of bright, primary colored dangle earrings, found here https://www.etsy.com/listing/87566858/bright-jewelry-dangle-gold-earrings-in also had me searching for a way to interpret this theme in a bracelet. But for the bracelet, the rubies were replaced with some ruby red coral nuggets cut into disc shapes. And warm gold pulls all the primary colors together and adds to the sunny, cheerful feeling in this design. In fact, I enjoyed this design so much, I interpreted it two ways, as is illustrated in the last photo: similar materials are used, but the arrangement is changed to feature red coral as front and center instead of the turquoise nuggets featured in this design. 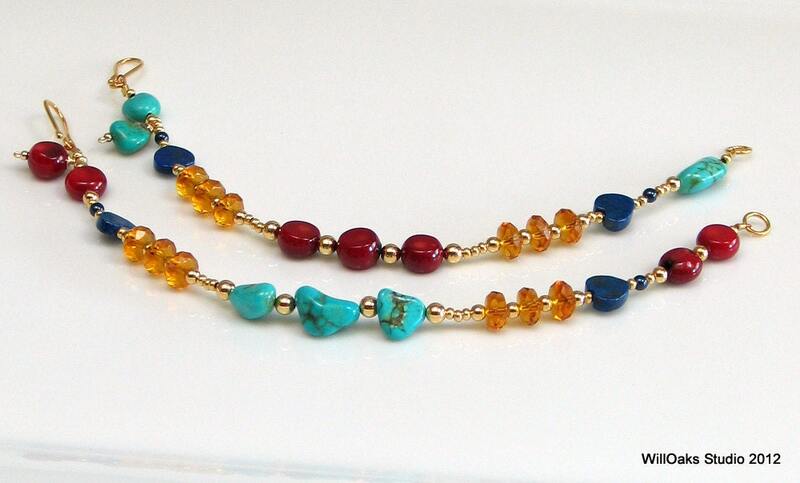 You may find this listing here https://www.etsy.com/listing/110914911/primary-colors-and-turquoise-beaded? Since the turquoise nuggets are organic and variable, I've included a photo of 3 examples to show the inherent differences that will show up in this design, which has been created as a small edition. The bracelet measures about 7 3/4" laid flat and will easily fit wrists up to 7" Presented in a small velvet bag or a signature kraft paper box, all ready for giving. It's a beautiful bracelet and extremely well designed and constructed. I particularly like the clasp which is easier to connect than a lobster clasp.